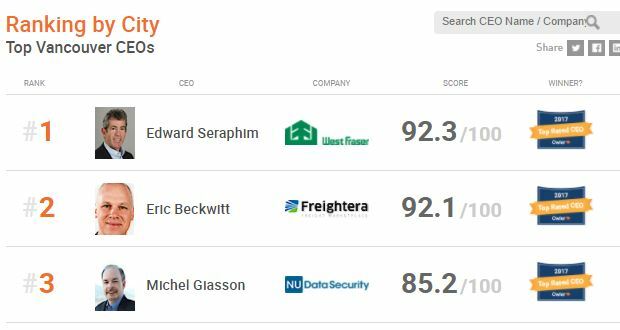 Freightera’s Eric Beckwitt just made top of the list of Vancouver’s most likable CEOs!! We may think that a CEO isn’t approachable or someone we will never ever meet in the office. But just like this nomination suggests, Eric is very likable indeed!! When I first met him in his CEO role, I was surprised how approachable and “humane” he is! And it’s something that many people comment on. Eric is very humble and never hesitates to pick up the phone to call any of the employees to spend quality time and on improving communication, or any customer for that matter. He is constantly looking for solutions so our online meetings can be more open and friendly – just like recently we started video-chatting instead of simple old audio. All that to say, yes, Eric is a very likable CEO!! Thank you Owler for your rating, and Vancouver Sun for featuring us.